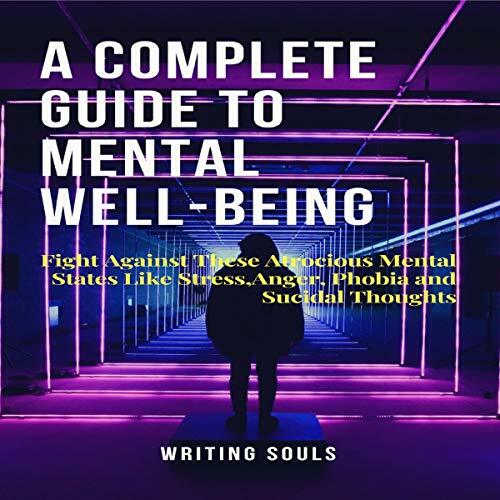 A Complete Guide on Mental Well-Being: Fight Against These Atrocious Mental States Like Stress, Anger, Phobia and Suicidal Thoughts. Stress. Stress is one of the human natures that every single person expresses. Moreover, there are so many ways to get rid of this, but a person should choose his own way by analyzing his situation carefully. Anger. It has been noticed that sometimes people make themselves angry so that they do not have to feel the pain inside because they think that it is better to feel angry than suffer the pain. Phobia. Many specific phobias cannot be prevented, and many people with a phobia do not seek treatment. They can cure that by just avoiding the object, or their tears are enough to control the problem. Suicidal thoughts. Many kinds of emotional pain can lead you to thoughts of suicide. If they are unable to think of solutions other than suicide, then it does not mean that there is no other solution. Listen to this audiobook and take control of your mental state. felling calm, confident and stress free. what a wonderful book from writing souls. mental well being is need of the time. I highly recommend this book to control your stress, anger and depression. You will get way to stay happy in life. great book to listen for mental peace and stress free life. after listening this one you will surely find a way to better live your life. Reading this kind of book is itself a relief in modern day stressful and hectic lifestyle. You will surely get a way for yourself to lead a stress free life. I am felling contended after listening this one. I am very much satisfied with the book content. very good book with important data and advises to improve mental health and stay stress free and happy. I highly recommend this book for its well researched content. very good advises are given for a stress free life. you will be surely relaxed after listening this book. the secret to calmness, happiness is given in this book. The content of this book is really wonderful to help anyone to achieve mental peace and give a way to live stress free life.